When it comes to internationally renowned jewelry from Germany, the name Saskia Diez is immediately recognized. Located in Munich, the 36-year-old creates unique filigree necklaces, rings, bracelets and other accessories. Her collections have been shown, and loved, in New York, Tokyo, London and at the Berlin Fashion Week. What makes this all the more surprising is that after training as a goldsmith and studying industrial design, she came to jewelry design by chance. Saskia’s studio and showroom can be found next to a shoemaker and a furniture restorer in a charming and quiet side street in Munich’s Glockenbachviertel. The spacious and relaxing backyard is a real beauty, with incredible trees, wooden benches and lots of green. Stefan Diez, Saskia’s husband and one of Germany’s most successful designers, also works there. In an interview in her studio we come to understand Saskia as a reflective, enthusiastic and amicable conversationalist. Naturally, on her wrists, around her neck, and in her ears, pieces out of her collection sparkled. Pieces so beautiful that you’d want to wear them yourself. This portrait is part of our ongoing collaboration with Elle Germany Online. See the second part of the story and conversation on their website. Saskia, what was the first piece you designed yourself? My first jewelry designs were the DIAMOND bracelets that I created for the 2006 design competition “Women and Sport” from Volvo. It looked like jewelry, but they were simultaneously weights for the arms. They are still very important to me, much of what I seek can be found in them. It was with them that I founded my label in 2007 and I derived my logo from one of those forms. What fascinated you about the world of jewelry? What fascinated me was how jewelry functioned, what jewelry makes of us. Jewelry is such an old theme, the need to adorn one’s self, it’s as old as mankind. The need to “recharge,” to strengthen through jewelry, barring adornment, of course. Vulnerability and the need for protection play a role. The other level of jewelry fascinates me. More than its superficial level, even if jewelry takes place on the surface. But it’s also possible for jewelry to infiltrate this. In and of itself, I’m not very interested in the value of jewelry. In my collection there is a very broad spectrum of prices, if a piece is expensive, the material or work is expensive, but I choose the material or technology based only on whether I like it and not according to what I could charge for it. My jewelry isn’t a status symbol. How would you define your philosophy? I like that my pieces are wearable. I find the interplay between my work and its wearer exciting. How does it lay on the skin and on the body? What does it do and how does it change when it moves, how do you feel with it? Gallery jewelry isn’t really my thing. How could I imagine your usual work process? I tinker and draw a lot. Between the beginning and the end can be a sometimes long, sometimes straight, sometimes very convoluted process and sometimes peppered with diversions. But even those are never in vain. Working on something is never in vain, often things exist in a different context or make a work richer. In addition to jewelry, you’ve also created a perfume. What got you into that? Scents are a kind of invisible jewelry. Some pieces in my collection are already at the limit of what is visible, so it was almost a logical extension, creating jewelry that was only discernible with the other senses. And then I had the good fortune to work with Geza Schön and we made a fragrance of the two metals silver and gold. You make exclusive pieces. Which has been the most extraordinary? I always like to make wedding rings. I like to tell myself that I’m contributing a bit to an especially happy marriage, if they decide to go with my rings. I once designed a ring for Mirko Borsche, who I work with a lot. He lost his signet ring with his family coat of arms, that was before we even met each other because I never saw it. Last year he asked me to make a new one for him. The result was pretty much exactly like the ring that he lost, even the stone and how it was engraved. Something seemed to have been very right. I also like the Charlie Edition for the club and restaurant Charlie from Sandra Forster. She was in Vietnam to research for the restaurant and she brought back a sketch of a tiger, which you can see on the restaurant menu. It became a bracelet in sterling silver on a red silk ribbon. You mentioned Mirko Borsche, who works close by in the Au. What do you think of the creative scene in Munich? I’ve been working with Mirko since I founded my label, at the time he was still with the Süddeutsche Zeitung magazine. I thought, if I found a label, I’ll have to go to Paris. And I thought when I go to Paris, I’ll need a look book. And when I need a look book, then I need Mirko Borsche. I asked him to make my first book, and that’s how we got to know each other. Over the years we’ve become good friends and like to exchange ideas. He’s a good counterpart. The creative scene in Munich is small but effective. Munich isn’t the city that makes starting something especially easy. From the beginning you’re under a certain pressure to finance your life. The rents are expensive that it’s not so easy to just try something out for a few years. And the “new” isn’t so sought after here. For the first year I sold almost exclusively abroad and for a long time in Germany I only had two customers: Andreas Murkudis and Schwittenberg. Now that’s changed. Of course! 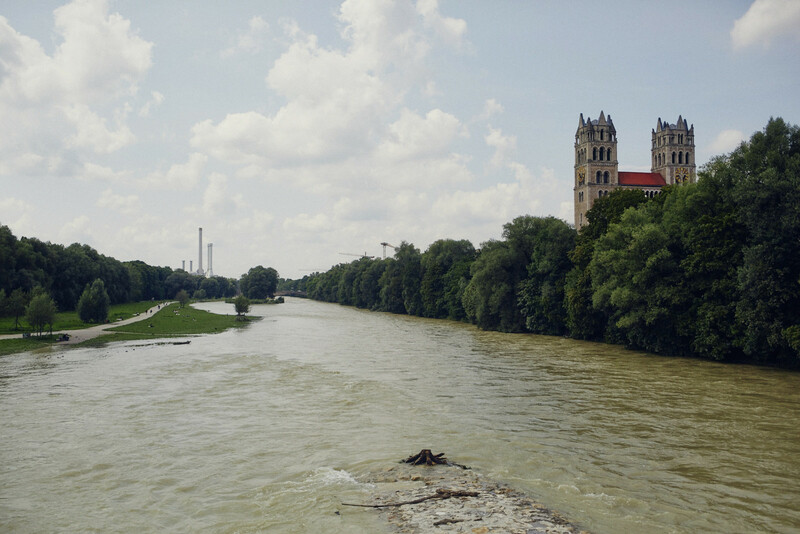 In Munich you can concentrate on your work really well and it’s a wonderful city, very green, a river, a good base. There’s a good infrastructure for handcrafts, manufacturing and education. This is really a treasure. And there’s a good public here once you have your foot in the door. On the other hand I also see how other places, in France for example, with the new generation or even their own brands, there’s a lot of support, it’s seen as a cultural duty. Munich could be inspired by that. Also in Berlin there’s funding, for example, when labels are shown abroad. How did the new collection you designed for Filippa K come about? One day a designer for Filippa K called and asked if I could see myself developing a collection for them. Then I flew to Stockholm, we ate lunch together in the rooms of Filippa K. A converted brewery on the river in the middle of the city. We had a good rapport with each other – they caught me with their charm. It was very uncomplicated. Did you work differently as you designed the Filippa K collection? Yes and no. It was cooperation, not a vacuum, but it still has a counterpart, a dialog, a partner even. When I work for myself, I’m the only one to judge me. But I don’t feel that I had to be bent, I think you can see that as well. Tell me about the philosophy behind the collection. It’s not about making something completely new for Filippa K, rather to take one or two characteristics out of my work that pass well to their brand and to work with them. The pieces should play with the contrasts: firm and flexible, smooth and structured, which occur in many places in my work. This suits the constitution of Filippa K really well. Simple, sometimes with almost austere cuts, much of it implemented in flowing fabrics. Minimalism in the sense of pulling back, purity, concentration, paired with a delicacy and sensuality. It was also really important that the pieces were “real,” that is to say, out of sterling silver and 18-karat gold. Your husband, Stefan Diez, has his workshop in the rear building of your showroom and studio. What do you both like about the location? Back here it’s like a small blind spot on the map. A place you don’t expect. It’s like an old courtyard situation, where different workshops are grouped around a cortyard. We live upstairs in the house, then there’s the showroom and my shop on the street, behind the studio are other rooms where people work who we’re friends with and who we work with. Julian Baumann, who I’ve often collaborate with; the artist Benjamin Röder, who has a studio here; Jens Buss and Johannes von Gorss, who are just now working on my website. I think it’s amazing that I can walk to the Isar in five minutes. I collect the pebbles there for my Isar stone collection. How could I visualize the creative exchange between you and your husband? It is a gift that we are working in similar, yet different, fields. We don’t have jobs that let us go at night, rather ones that are important parts of our lives. And there it’s good when you can have exchanges about it. And there are also concrete joint projects: We did the design for my shop together, the paper bags are a cooperation, and Stefan likes to pull me into his jobs as a counterpart. You have three kids. How do you do it – coordinate your job and family life? Is there really this stereotype that men give jewelry to women? Sure, I have many male clients that want to give their wife or girlfriend my jewelry. And also quite a few that want to buy something for themselves. But most of the people that come to me are women who are choosing my jewelry for themselves. That makes me happy. Your label has a strong focus on sustainability. Why is this important to you? I think it’s good when the added value is related the point of production, that I can contribute to the employment of handcraft here. I produce in Germany, in Munich and in the surroundings, like in Pforzheim. For the most part gold and silver are recovered in the recycling process. For two collections I had the material manufactured in India, but I was always there myself, I got to know the girls, they were friends of a family that I know who themselves are working on their own collection. How do you still manage to work efficiently? My label is very streamlined. I have a small team and we work a lot on optimizing the process. The proximity to the river. I like having water close by. And my street. Where no one gets lost by chance. For me it’s a luxury standpoint, everyone who comes here wanted to come here. Do you have any favorite cities? It’s hard to say, there are so many great places in the world and so much depends on the circumstances of why you’re there. But I like the South of France and the light there. I like Marseille. I think Japan is very exciting. I’m going there in November, in the south, where I’ve never been and I’m looking forward to it. India is amazing and impressive. I like to go there, but every time at some point I also have enough of it. I don’t have a real sense of home. I feel comfortable in a place pretty quickly and I’m not so rooted. On the occasion of the jewelry collaboration between Filippa K and Saskia Diez, we spent some time with Saskia to hear about her philosophy and glimpse into the new exclusive collection she’s designed for the Swedish brand that will be launched on October 23. Thank you Saskia for inviting us in your charming showroom, talking to us about your influences and taking us through your various jewelry designs. Look through more of Saskia’s creations here. Interested in Munich’s creative scene? Discover more interviews and portraits here.